Summer is a fantastic time to learn about science! The warm temperatures bring tons of changes to your local ecosystem for kids to explore. The weather doesn’t always cooperate though which can quickly lead to being stuck indoors. Science can also be the key to turning those rainy days into brainy days with indoor experiments and activities! 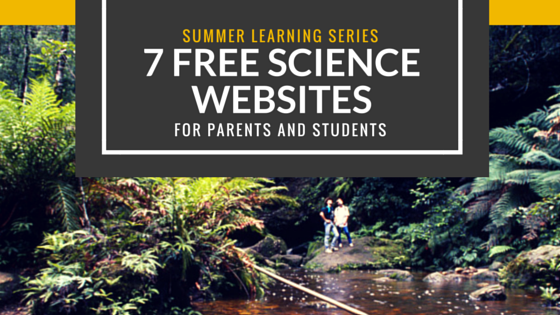 Continuing our series on summer learning, here are seven free science websites for kids. HowStuffWorks – This site is an amazing resource especially for curious kids. It contains thousands of articles explaining exactly how stuff works across a wide variety of categories. From animals to technology, health to culture, this site has it all! Many of the posts contain videos or links where you can dive deeper into a given topic. KhanAcademy – The online leader in “micro lectures”, Khan Academy is an excellent resource for all things science. The site takes the core area of science and breaks it down into eight categories with many subcategories underneath. The lessons are videos, typically less than 20 minutes in length. There is no doubt your child will find valuable information on Khan Academy. Steve Spangler Science – This site is just awesome! It is filled with experiments that families can do at home with household items coupled with videos explaining how to do each one. My favorite, and apparently everyone’s as well, is the Slime Party. You can find those under the heading “The Lab”. There are also kits you can purchase to take the learning to a whole new level. You have to check this one out! Science Explorer – While not as robust as Steve Spangler’s site, Science explorer has about twenty five science activities that parents can do at home with their students. It has quite a few experiments not listed on similar sites so its worth a look. Ask Dr. Universe – Hosted by Washington State University, Ask Dr. Universe is a collection of science questions and answers asked by students from around the globe. While it is similar to HowThisWorks, Ask Dr. Universe is geared toward younger children (6-12). The site is more engaging and explanations are easier to understand for the younger crowd.